Since a lot of spinning is self-taught, my general approach is to tinker with Maddy over and over again until things seem to work out. I have a sense of the two tensions and how the physics of the wheel work but it’s at this point still a fairly basic understanding. But eventually, the tension seemed to even out….or perhaps my drafting got a bit better after an hour or two of trying…and I started to get results. 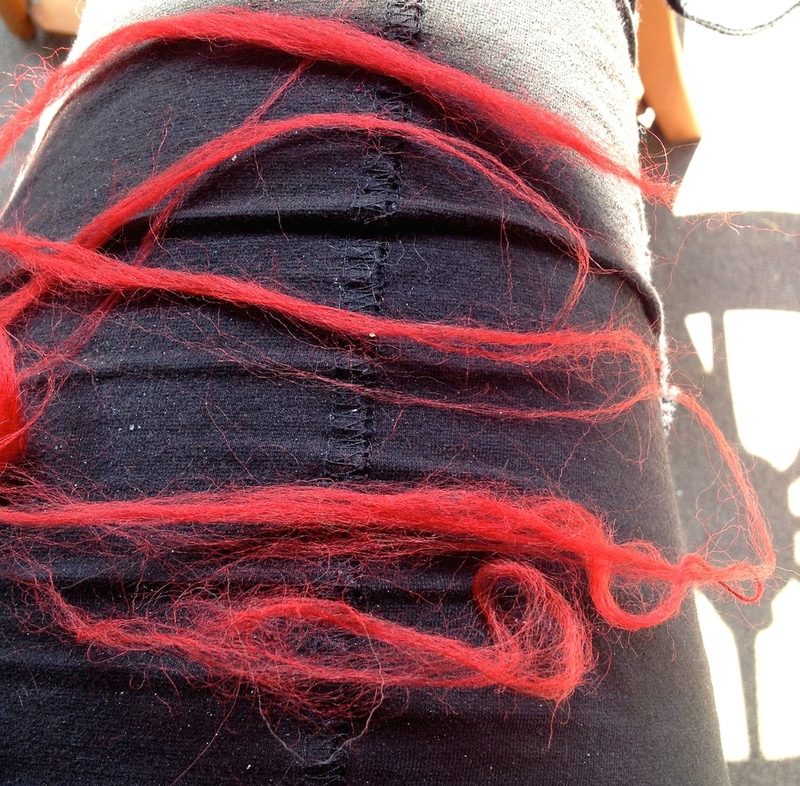 Some lovely red yarn began to accumulate on my bobbin. Thick, thin and all sizes in between, but it’s all good, it was yarn! 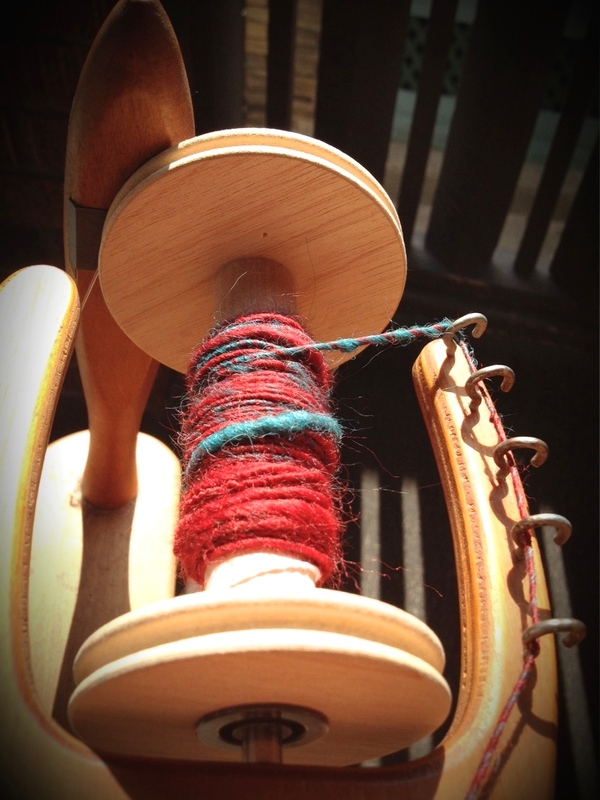 So far I have only worked with one colour when spinning. I don’t have carders of any kind so I haven’t had the opportunity to comb colours together…..
SIDENOTE: I came across a video for the Ashford Blending Board today though….and it looks like so much fun!! Sadly, my birthday was in January but I’m sure there’s another day coming up where a gift would be fitting….any day that ends in ‘y’ methinks! ….so I decided to try spinning some colours together today. These past few weeks, I have really fallen in love with the colour play between red and teal. They are so opposite and in conflict that they go together 🙂 They also have a vintage kind of feel. In hindsight, I can see the problems with my spinning attempt. 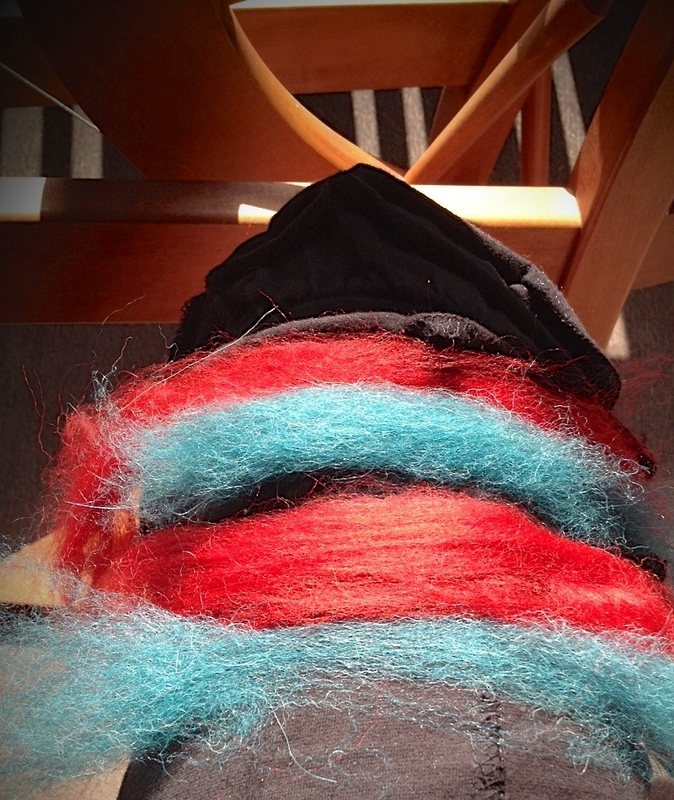 The consistency of the two rovings are vastly different so although the red turns out fairly smooth, all the teal parts of the spun yarn are fuzzier. Although because I am still a newbie…my drafting isn’t perfect so rather than having a striped sort of effect, my resulting yarn is striped in spots, sometimes red only and at times the teal takes over. I could think of other ways to do this. One idea was to spin each separately and then ply them for a striped effect. Or I considered holding off until I had the ability to comb them together with hand carders or something. But when I visualize how the resulting random mish-mash of red/teal would look by just combing them together, I don’t think I would like it.